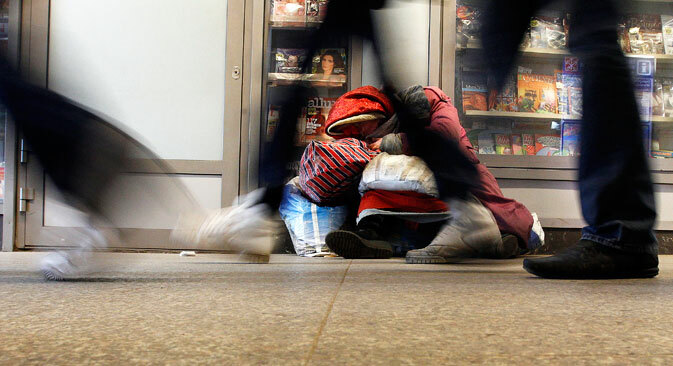 A homeless woman sleeps in an underpass to shelter from temperatures of around 17.6 F in St. Petersburg. Economic crisis in Russia is being accompanied by an unprecedented decline in household incomes as well as rising poverty levels. The fourth economic crisis in Russia in the last 25 years is being accompanied by an unprecedented (over the last 15 years) decline in household incomes, as well as rising poverty levels. This is all occurring at a time when there are few resources for social adaptation. The forecasts are disheartening: analysts are expecting a massive decline in living standards and the quality of life among citizens. In terms of poverty levels in society, all the gains made during the last decade could be liquidated in 2016, returning the standard of living to 2005 levels. As recently as 2013 no one could have foreseen the sanction wars and few predicted the fall of oil prices to current levels. Yet even back then many economists forecasted that in the near future the consumption bubble, bloated by very high oil prices and generous budget payments, would burst. Since 2006, GDP levels in Russia grew, while they have declined around the world since 2007. This, however, had a negative impact on the competitiveness and productivity of the economy. In 2014, this indicator was comparable to the world average (52 percent), exceeding the average in developing countries by 11 percentage points (41 percent). The year 2015 was marked by the sharpest real drop in incomes, wages and pensions in the new millennium. It was accompanied by an increase in underemployment, which will continue into 2016. Russian experts and analysts at the World Bank agree that even the official poverty rate will increase to 16 percent in 2016. Oil revenues will no longer suffice to support household needs. Neither the state, nor companies, nor the majority of households have the resources needed to support the consumer-based model of economic growth, while effective instruments for the redistribution of wealth and social adaptation have not been created. Despite the rapid growth of incomes, due to constant ultra-high concentration of wealth in certain social groups and regions, the level of inequality in society has not changed. In 2014, 20 percent of the population lived on incomes of 7,000 rubles per month and between January-September 2015 they accounted for only 5.6 percent of total revenues. However, the real level of income stratification is much higher in Russian society than is often acknowledged. In October 2015, Russian respondents believed that one percent of the wealthiest citizens of Russia received 53 percent of total revenue. However, the actual figure is closer to 70 percent, according to a study entitled, “Pitfalls of Perception-2015,” conducted by Ipsos Public Affairs. According to Russian analysts, in the near future from 30 percent to 50 percent of the population of the Russian Federation may join the army of the poor – primarily children, pensioners and their families, as well as part-time workers, and if they do not know this yet, they will surely learn about it in 2016.